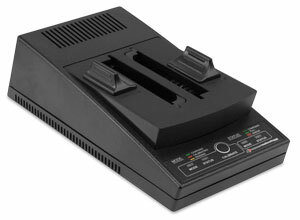 Remaining in a Newer Technology NuPower Battery. Make sure the battery is properly conditioned. Either follow these instructions for conditioning the battery manually or use the Newer Technology Intelligent Battery Charger and Conditioner for your model battery. Make sure the battery is fully charged and the power adapter is connected. 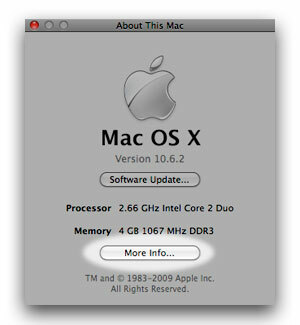 The easiest way to do this is to select "About this Mac" from the Apple Menu, then click the "More Info..." button in the window that pops up. Select "Power" from the list on the left. This is located under the "Hardware" heading. All the subheads are listed alphabetically. Find how much charge is being held. Under the "Battery Information" section on the right, there will be a section called "Charge Information". If the "Fully Charged" indicator states "Yes" and the "Charging" indicator states "No," then the "Charge remaining" is the charge in milliamp hours (mAh) that your battery is currently capable of holding. The "Full Charge Capacity" is the maximum amount of charge (in mAh) that your battery can take; as batteries degrade over time, this number represents the battery's capacity when new. Determine how much of the maximum capacity your battery is retaining. 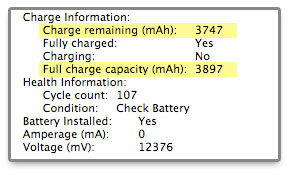 Divide the "Charge Remaining" number by the "Full charge capacity" number, then multiply by 100. This number is the percentage of the original capacity that your battery is currently capable of retaining. Newer Technology NuPower® Batteries are considered within normal operating parameters if they retain 80% or more of their original capacity when tested in this manner.